Apple has released the first beta of iOS 8.1.1 to those participating in the iOS Developer program. The update arrives as build 12B432 and is said to include multiple bug fixes, as well as performance improvements for the iPad 2 and iPhone 4S. 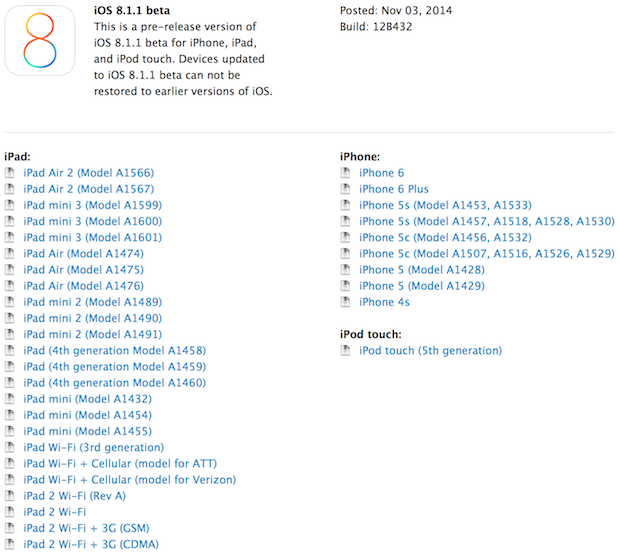 Being a minor release, it is unlikely that iOS 8.1.1 will include any new features. iOS Developers can find the iOS 8.1.1 beta 1 IPSW files available to download on the iOS Dev center website. The iOS 8.1.1 beta build is compatible with all devices able to run iOS 8.1, including iPhone 6, iPhone 6 Plus, iPhone 5S, iPhone 5 and 5C, iPhone 4S, iPad Air 2, iPad Mini 3, iPad Mini 2, iPad Mini, iPad Air, iPad 4, iPad 3, iPad 2, and iPod touch 5th generation. There is no known public launch timeline for iOS 8.1.1, thought is typical for iOS beta builds to go through several beta versions before a wide release. On the Mac side of things, Apple has released the first developer build of OS X 10.10.1, which also emphasizes bug fixes. Additionally, a beta build of Apple TV software is available on the iOS Dev Center. I hope this update will resolve the battery drain in iPhone 6 plus! I was happy when I first got the iPhone with iOS 8 – the battery life really amazed me – but the dismissal of the notifications was buggy too. However, ever since i’ve updated to 8.1 I’ve hated my iPhone! The new update fixed the notification problem (YAY) but the battery remains the same! Can’t apple fix two things at once? Do they have to ruin one thing to fix the other? Does anyone know if this finally fixes the music playcount stacking bug? Mind-boggling how they managed to break such a basic feature. 8.1.1 reportedly breaks the IOS 8 Jailbreak. You used to be able to turn the camera light off in lock screen with a simple tap of the camera icon but now that doesn’t work now which is a shame. It would be nice to also fix the battery drain in the iPhone 5s!! This BETTER fix #syncgate ! I would like to have back sms delivery receipts…. Note: I have all background updates turned off, disabled all features beyond phone function and sms, and have replaced the old battery. I still watch my battery percentage count down each minute or two of use in real time. Stand by time remains strong, with drain only occurring when the operating system is engaged (pointing power drain squarely at the os, no excessive drain was ever encountered on iOS 5). I currently have little faith Apple will solve this. I dare them to prove me wrong. This stupid update RUINED my 4s. It shut off imessage, and when i try to go into settings and turn it on again it freezes. I can’t use the call app, facetime or messaging in general. PLEASE TELL ME IM NOT THE ONLY ONE HAVING THIS PROBLEM!